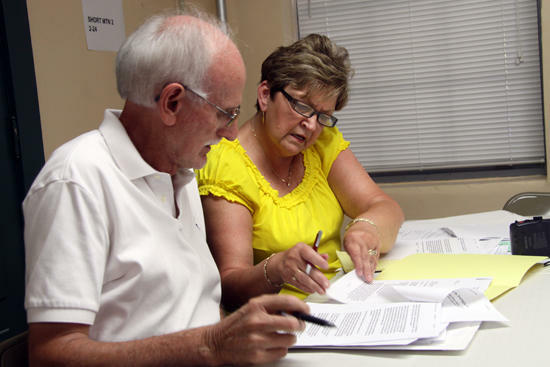 Election Commissioners Jackie Gannon, left, and Sue Patrick review a list of proposed poll workers Thursday night. There was an oddity of sorts during the Cannon County Election Commission regular meeting Thursday (June 14) - Democrats and Republicans were in unanimous agreement on all topics discussed. Three of the five election commissioners were present - Chairman Jackie Gannon (D), Matt Studd (R) and Sue Patrick (D). Commissioners Lindberg Dennis (R) and Louise Mayo (R) were unable to attend. Dennis was ill and Mayo was dealing with the loss of her mother, Mary "Chilley" Davis Mooneyham, who passed away earlier in the day. Deputy administrator Dorinda Mankin's salary generated the most discussion during the budget portion of the meeting. Mankin's salary was set at 30 hours and $20,000 annually, a slight increase from the $19,500 that was in the initial budget. It was also stated the position would not accrue overtime and that the employee would be budgeted for 30 hours with comp time. 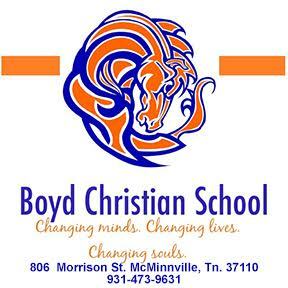 Election administrator Stan Dobson indicated the salary had not been voted on or approved and suggested it need to be discussed; however, Patrick revealed the issue had been voted on and approved during the May meeting. "This is what the Board voted for and this is the way it is going to be," Patrick said. "We have not approved that," Dobson said. "If you will refer to your minutes from last meeting you will see we took a vote for (Mankin) to be on 30 hours salary with no overtime," Patrick said, and then started reading the previous meetings for factual backing. "The (County) Commissioners agreed to our budget amendment because they understood we were putting (Makin) on salary and she would not be drawing overtime again," Patrick said. According to the minutes, Gannon suggested Mankin be moved to salary based on a 30-hour work week with comp time if she worked over. Patrick said the minutes also indicated Dobson stated he had no problem with Mankin working 30 hours even though he believed she was needed for 34 hours. Patrick made the motion and it carried 3-1 with Gannon, Mayo and Patrick voted in favor. Studd voted against and Dennis was not present. During this discussion in the June meeting, Mankin told election commissioners she was willing to meet them halfway and work "32 hours." The problem, according to Mankin, is time off. "It is not fair to me when those people (at the Courthouse) get to work 32 hours or more and use their time and lose nothing," Mankins said. "If I take a personal day (sick or vacation) I have to use a full (eight-hour) day. They do not do it by hours. If I take a day (7 hours), I get 8 hours taken out of my pay because that is the way they do it." Mankin said she has lost a full day of pay since May, 2009. "You are offering comp time but if I leave this job and have not used that comp time then I lose it and you have worked me for free," Mankin said. "I would suggest you make sure you use your comp time before you leave," Patrick said. The commissioners agreed it is not fair for Mankin to have eight hours taken for a personal day when her work day is based on a seven-hour day. They were unanimous in addressing the issue. After going through the remainder of the budget items the Commission unanimously agreed on the $165,439 budget to be presented to the County Commission, including a 30-hour salary with no overtime for the deputy administrator. In other business, Helen Minton was added to early voting as a democratic representative. "We need to add a democrat to early voting because we have to be represented by a democrat, and I want to add someone who voted democrat in the last election," Patrick said. The commissioners also went through potential poll workers and declared them either as democrats or republicans. "Are these people with no voting record young people who are now just old enough to vote?," Patrick questioned. "I don't think anyone should work an election if they are not interested enough to vote." Most of the younger persons who wanted to work and did not have a voting record were young people who have just registered, according to Dobson. The commissioners went through the list and approved workers for each of the precincts, including one for each party for each location, including Early Voting and Nursing Home. There was discussion regarding party alliance. "We have to have a delegated democrat and republican at each poll," Patrick said. "I want to be sure we have one at each polling place." Workers were picked based on their voting record but, specifically, how they voted in the previous electiond where democrats were concerned. When Patrick did not want to approve a worker as a democrat because they voted republican in the previous election, Dobson pointed out most of these people are democrats. "Some of these people are democrats and have always voted democrat until last time and they were not happy with what was offered so they either didn't vote or they voted republican," Dobson said. "I am not going to hold that against them. I trust every one of these people." Patrick said she also trusted them but was going by the last election. "I trust every one of them too but the whole thing is we are to designate someone to represent the Democratic Party," Patrick said. "I want people who voted democrat in the last election. We have to have a delegated democrat and republican at each poll and I want to be sure we have one at each polling place." After workers were approved Studd introduced a motion to "take the guess work out of it." "We are not doing it justice be taking a guess or stab at this based on voting records," Studd said. Studd's motion called for an application to be filled out by potential polling workers. The application would include a place to designate republican, democrat or independent. The motion passed 3-0. The commission also voted to move precinct lines to match the county district lines from the city annex and also locked the ballot boxes for all precincts. The Election Commission also approved dates and times for early voting (7/13 - 7/28). They are as follows: July 13, 16, 17, 18, 19, 20, 23, 24, 25 and 27th from 9:30 a.m. to 12:30 p.m. The three Saturdays are July 14, 21 and 28 from 9 a.m. to noon. The late day is June 26th from 4-7 p.m. Nursing home voting will be July 26 at 10 a.m.